2014 is a pivot year, turning Vintage in a radically new trajectory. Consecutive years of lackluster printings and top down set design had left the Vintage card pool surprisingly stagnant, with players pining for more interesting offerings for Vintage consideration. Dack Fayden was properly recognized as a game-changer, but the printing of a pair of absurdly powerful draw spells with the Delve mechanic created an overwhelming synergy with Dack Fayden that was quickly and brutally exploited. 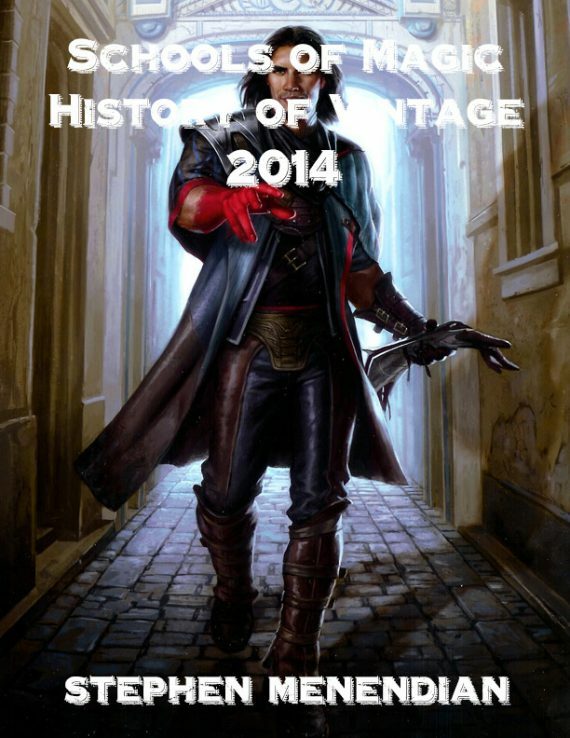 Learn about this and more in the latest installment of the History of Vintage. As the new year dawned, Vintage players had much to celebrate. The fairest deck in the format had won the Vintage Championship less than two months before, and the Vintage format appeared genuinely healthy and diverse. Community engagement was equally vibrant, with several annual large-scale venues to compete in major Vintage events on multiple continents, and myriad smaller tournaments organized at the local level. Vocal agitation for restriction to curtail the Dredge deck had receded as a gradual stream of printings such as Rest in Peace and Grafdigger’s Cage helped contain the devious and relentless Reanimation strategy. Similarly, the caucus of disgruntlement over the Time Vault errata and the printing of Tezzeret seemed less pressing as Time Vault Control became an accepted background feature of the Vintage landscape. RUG Delver had shown much promise in 2012, but while it performed admirably in 2013, it didn’t quite feel like it had yet lived up to its full potential, or the hype. More seriously, ever since Worldwake, Lodestone Golem-powered Workshops decks periodically flirted with metagame dominance, rising up to pack Top 8s and claim tournament titles. In each instance, the threat seemed to subside a bit, and subsequent tournament data counseled a patient approach to the Lodestone menace, of watchful scrutiny. But the menace of Golem-based Workshop decks loomed over the format, like a community living within a quake-prone fault zone. Return to Ravnica’s contribution to the format helped check the O’Brien School’s worst impulses, by providing tactical support like Deathrite Shaman and Abrupt Decay, helping to defeat Forgemaster Shops in both Bazaar of Moxen Vintage tournaments in 2013. In terms of Banned and Restricted List policy, this had been a period of unprecedented calm. Never before in the history of the format had there been two consecutive years without restriction, and by January 2014 it had been four and half a years since the restriction of Thirst for Knowledge. Bit by bit, the Restricted List shrank, as the DCI pruned fan favorites to expand the Vintage card pool. By the end of the year, however, this era of good feelings would draw to a close, and the format would begin a new phase characterized by a long and contentious period of correction and DCI intervention. The second set in Theros block, and the 63rd overall Magic expansion, Born of the Gods was officially released on February 7 2014. The focal point of Vintage attention was undoubtedly a new “creature enchantment” that fit readily into existing hatebears strategies, Spirit of the Labyrinth. In his set review, Brian DeMars declared that “All in all, Spirit of the Labyrinth seems to be a card that will likely see a ton of Vintage play and may have a profound effect on the format moving forward.” Accordingly, he devoted the better part of his review to expounding its merits. The seasonal chatter and periodic discussions regarding spoilers struck a notably different tone with this set. The ‘So Many Insane Plays’ podcast team stretched airtime to cover a mere three cards in our set review. Beyond Spirit of the Labyrinth, Brian DeMars more generously declared that the set contained “a few decent fringe players that may or may not find a niche somewhere along the way.” Driving home community concerns with recent set releases and design trends, William Winger penned a satirical review that featured mostly fabricated card designs. After misleading a number of more gullible community members, a few days later William confessed that he was “incredibly frustrated with Born of the Gods, which I think is a terrible set for me and how I like to play Magic, and furthermore because I am feeling increasingly like an outsider in the Magic community who doesn’t play Magic the right way, because I don’t play Standard and Limited and I like to cast spells more than I like to play creatures.” William touched a nerve, and players wondered whether Vintage would ever see great cards again.